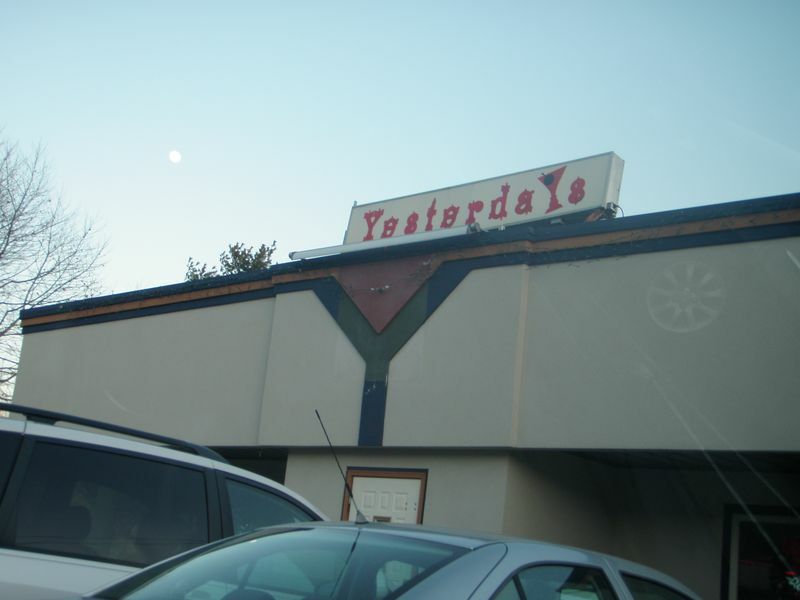 Yesterday’s is a local bar & grill in Clifton that’s been around for well over 20 years; I’d heard they do a good burger, but never got around to going there. I regret waiting so long- they make an excellent bar burger that stands with many specialty burger joints. 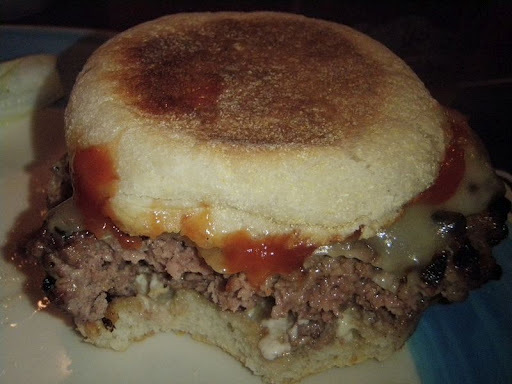 You can get your burger on a bun, but they prefer a grilled English muffin as standard, and it is one of my favorite burger delivery systems. It had a slight char and was sliced instead of fork split, so it didn’t have the craggy edge I prefer, but it was still quite good. 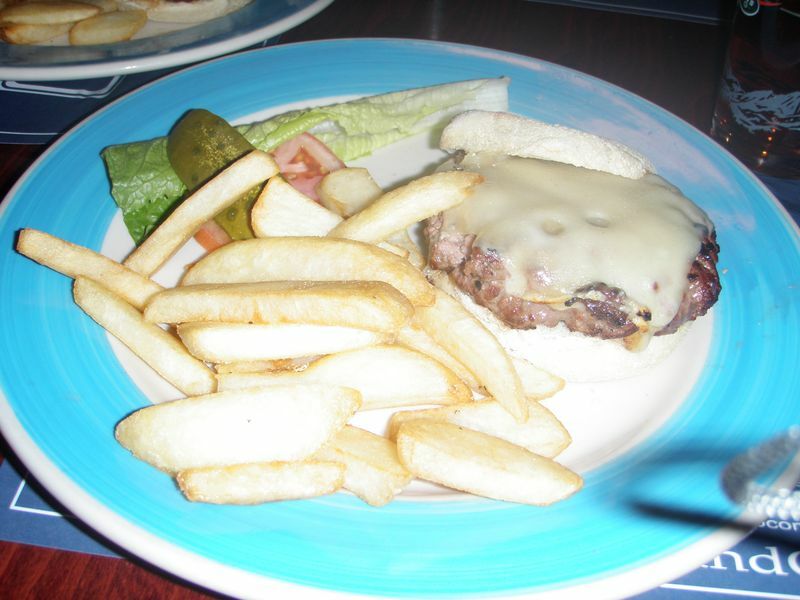 But what was impressive was the juiciness of the medium-rare burger and the taste of the meat. Steak fries come standard; they are decent but nothing special, not as crisp as I’d like- Steve’s Sizzling Steaks (full review) does better fries. 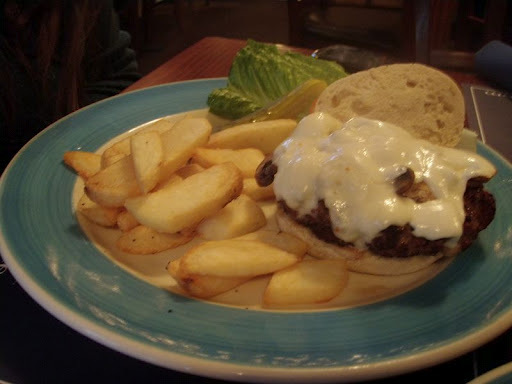 But the burger here was superior, making it one of the better Jersey burgers I’ve had, especially for the price. Both of us got out of there for $25, with a beer each. They have daily beer and food specials, so check their website for details. Firecracker got the garlic mushroom burger with mozzarella, which was tasty. I had Swiss. The burgers both had a good char crust, without being dried out, which makes them better than 90% of the bar and diner burgers in New Jersey. Even the Cloverleaf (full review), my go-to beer bar, tends to overcook their burgers unless you make it really clear you want some pink inside. Yesterday’s cooks to proper order. I’d go back again in a heartbeat, but I’d prefer a bigger beer selection-Yuengling and Blue Moon are fine and all, but how about some Sam Adams and Guinness?